You should consider Crest Cleaning Service for your Seattle janitorial services, regardless if you’re trying to replace your current janitorial service or you need a janitorial service for the first time. We have numerous years of experience providing high quality janitorial services, at affordable prices throughout the Puget Sound area. All of our employees are dependable, experienced, well-trained, and uniformed. Obviously, before they are hired, all of our employees undergo an extensive background check. Contracting with Crest Cleaning service for your Seattle janitorial services for all of your janitorial needs will relieve you of the increased expense as well as the personnel headaches with employing your own janitorial staff. We offer the manpower, flexibility and years of experience required to accommodate the changing requirements of both large and small commercial enterprises. It is critical to us to keep your commercial facility clean and with the absolute best appearance possible. 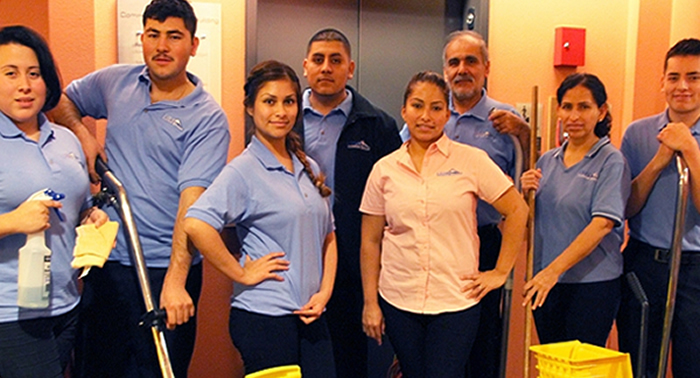 We have many commercial customers who trust us to handle all of their janitorial requirements. Our objective is our customer’s satisfaction and we prove that by guaranteeing our work. For all of the janitorial services that we perform, you will receive a detailed room by room checklist. You will know exactly what janitorial services have been performed in your office spaces. We will return within 24 hours and correct any problem if you have any problem with any aspect of our service, and called us that day. We offer one time, weekly, bimonthly, or monthly office cleaning services. We know which cleaning product for each kind of surface that will produce the best results. In addition, you won’t have to micromanage your cleaning requirements because our janitorial management staff will take care of your office building. We will make your job easy because we provide outstanding janitorial cleaning services and are dependable. You should also know that you will have our full corporation for anything that you might need. We also have experience janitorial cleaning very large luxury houses having 7,000 square foot of space and some very large office buildings in the Puget Sound area. These days, everybody has a concern about the environment and we are no exception. We practice green janitorial cleaning by using nontoxic, environmentally friendly cleaning products that are safe our employees and your office staff. All of the cleaning products that we use are labeled with the specifications labeled on the bottle so that you can be assured that we are using green friendly products. Basically, we want help you to understand how inexpensive yet important using our green cleaning products is, as well as our green cleaning practices that will help you with the rigorous certification for LEED (Leadership in Energy and Environmental Design) building requirements. All of our cleaners undergo random drug screening, have had background checks, and are professionals in uniform. Our cleaners know how to use the equipment and cleaning products properly in the areas that they are in and have also been properly trained in OSHA methods. We make sure that our cleaners are knowledgeable about the janitorial industry and remain safe through our monthly employee safety meetings. Our standard five star quality service will exceed your expectations. We create a quality control sheet for the office spaces that we clean, in accordance with the required frequency of cleaning, and each office space is signed off by our cleaners. In order to makes sure that we are providing quality office cleaning services to you, behind our cleaners, our management team comes in to inspect the office cleaning services that we have provided. During your quarterly or monthly building inspection, we will provide the quality control sheet to you for your review. Crest Cleaning Services has become a leader for Seattle janitorial services in providing janitorial cleaning services to many different office buildings and luxury homes in the Puget Sound area. We also clean commercial buildings and have a separate division got cleaning floors. We are more accountable and accessible to our customers because we aren’t a national franchise but rather local janitorial office cleaning company. The executives or our company will create a custom office cleaning program for you that will expand as your company expands. Our employees are trained in the best and most modern office cleaning te3chniques will execute that program and leave your office spaces sparkling clean. We are a leader in commercial office cleaning and we will stop at nothing to deliver the absolute best janitorial office cleaning services to our customers. We will stop at nothing short of providing the absolute best janitorial office cleaning services because we understand that your highest priority is your customers and their office spaces. Crest Cleaning’s Seattle janitorial services are considered the best in the business for providing excellent janitorial office cleaning services in the Puget Sound area. The leaders of some of the major businesses in the Puget Sound area depend on us for our steadfast dedication to our customers’ satisfaction. We pride ourselves in being the best janitorial office cleaning business and that means the best possible cleaning results for you. Our quality control system mandates that all cleaning services are routinely inspected and scrutinized to make sure that we are always held accountable. Our dedication to being the best janitorial office cleaning business makes us your best selection for janitorial office cleaning services.